Jendzjowsky, Lidia. "Alison Redford". The Canadian Encyclopedia, 01 November 2018, Historica Canada. 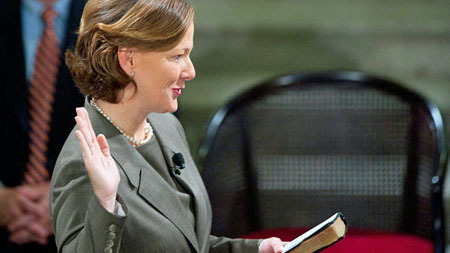 https://www.thecanadianencyclopedia.ca/en/article/alison-redford. Accessed 20 April 2019. In her childhood, Alison Redford lived in Nova Scotia, Borneo and Malaysia before her parents chose to settle in Calgary	when she was in her early teens. Redford graduated from Bishop Carroll High School in Calgary. In 1983, while still in high school, she was elected president of the Progressive Conservative Youth of Alberta. She completed a law degree at the University of Saskatchewan	College of Law in 1988. Redford was active in provincial and federal politics from the 1980s. She served as Senior Policy Advisor to Joe Clark, Secretary of State for External Affairs, and in the Office of the Prime Minister of Canada	under Prime Minister Brian Mulroney (from 1988 to 1990). While with the federal government, she organized a series of national consultations aimed at gathering public input on federal white papers concerning foreign affairs	and defence policy. Redford’s work with the Canadian government prepared her for her involvement in international projects. Throughout the 1990s, Redford worked as a technical advisor on constitutional	and legal reform issues in various parts of Africa for the European Union, the Commonwealth Secretariat (see Commonwealth), the Canadian Government and the Government of Australia, specifically focused on human rights litigation, developing education programs and policy reform issues. In 1999, she was employed as the communications officer on the Committee for Justice Reform for the Government of Alberta (see Provincial Government). After the Progressive Conservative Party and the Reform Party merged in December 2003 (see Conservatives Unite), Redford unsuccessfully challenged MP Rob Anders for the Conservative nomination in the federal riding of Calgary West. One of Redford's most notable appointments was by the Secretary-General of the United Nations as one of four International Election Commissioners to administer Afghanistan’s first parliamentary elections held in September 2005 (see War in Afghanistan). She also served as an advisor to the Privy Council Office of Canada’s future involvement in Afghanistan subsequent to these elections. On the international stage, Redford’s work has included assignments in Bosnia and Herzegovina, Namibia, Uganda, Zimbabwe, Mozambique and the Philippines. Before seeking election to office in Alberta, Redford managed a judicial training and legal reform project for the Ministry of Justice and the Supreme People’s Court in Vietnam. In the 2008 Alberta provincial election, Redford was elected as the Member of the Legislative Assembly (MLA) for the district of Calgary–Elbow. She was subsequently appointed Minister of Justice and Attorney General by Premier Ed Stelmach (see Cabinet). During her time as an MLA, Redford also served as a member of the Agenda and Priorities Committee, the Treasury Board, and the Cabinet Policy Committee on Public Safety and Services. In 2011, Redford resigned from the Alberta Cabinet to devote herself to her campaign to succeed Premier Ed Stelmach as leader of the governing Progressive Conservative Party in Alberta. Redford was elected leader of the party on the second ballot on 2 October 2011. As a result of her nomination, Redford became the 14th premier of Alberta, and the province’s first female premier. For the first time in Canada’s history, four women were simultaneously premier of a province or territory, including Kathy Dunderdale (Newfoundland and Labrador), Christy Clark	(British Columbia) and Eva Aariak (Nunavut). In 2012, Redford called a provincial election (see Canadian Elections). Political observers and members of media watched as she campaigned against the right-wing Wildrose Party	and its leader Danielle Smith. Many thought that for the first time in over 40 years the Progressive Conservative Party would not win a clear majority. However, on 23 April 2012, Redford’s party prevailed, winning 61 of 87 seats and becoming the 12th consecutive Conservative majority government in the province’s history. Redford became the fourth woman in Canada’s history to lead a provincial party to victory in an election. Those before Redford include Kathy Dunderdale , Pat Duncan (Yukon) and Catherine Callbeck	(Prince Edward Island). On 23 March 2014, Redford resigned as premier after weeks of caucus unrest, in which members either threatened to leave the party or left the party to sit as independent MLAs. Redford’s resignation followed a year of controversy revolving around her use of public funds for personal and partisan uses during a period of cutbacks to public services. By the end of her premiership, Redford’s personal approval rating had fallen to just 18 per cent, and support for the Progressive Conservative Party was down to 19 per cent. Redford stepped down from politics that August. In 2017, Redford began work as policy adviser to the government of Afghanistan. Her position was developed as a partnership between the World Bank and the Afghanistan ministry of mines and petroleum. Redford’s job is to help develop the country’s oil and gas sector.